Information-sharing service for seniors around the Queen Elizabeth Park. People who subscribe to Up Your Street represent all the diverse ethnicity of residents in places around the Queen Elizabeth Olympic Park and because they’re of the New Generation (phrase coined from a Soapbox participant meaning that for the first time seniors aged beautifully 50 up to 90 say have accidentally created the first definite cohort rather than being the older generation which meant the invisible crowd. “New Generation suits.”) they have seen and experienced multi-culturalism in its flourishing wave in the eighties. 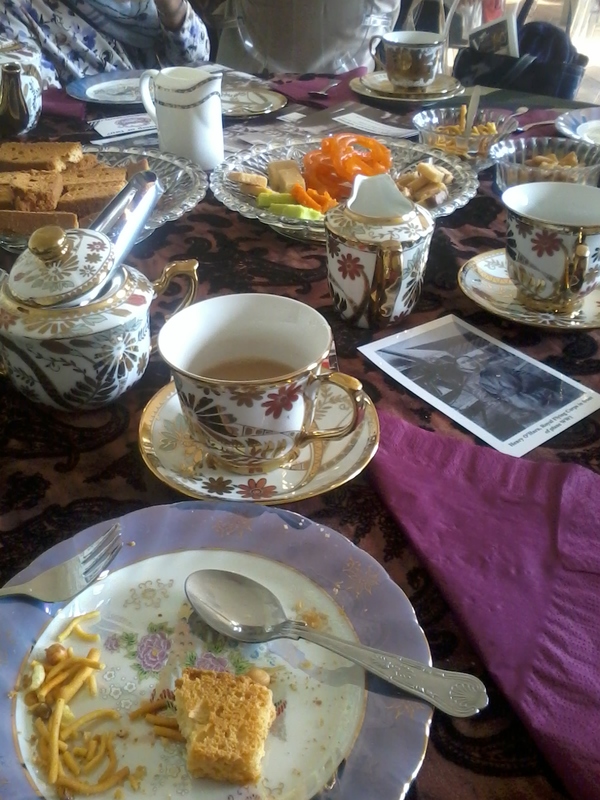 So those assembled at today’s reminiscence tea knew of chai and Indian sweets and snacks. They eat and cook all foods, make cheese sandwiches and samosas, drink Lassi and tea from every plant. No flies on them. They managed to gobble all the sugar on the table. The scene was set at Valentine’s Mansion being the tea time scene of a rich Indian family circa 1914. The meat was in the questions posed by Eastside Community Heritage, questions that forced debate and family memories, individual opinions and a willingness to learn from each other. We discussed Ghurkhas, Trinidadian dads with gas masks, second-hand tea leaves, telly programmes about Indians in the British Army, “Who Do You Think You Are?” recruitment of boy soldiers, and so much more emphasising that we were not surprised that millions of Indian men served under George Vth : first hand stories from granddaughters sitting drinking masala chai on a hot September afternoon in the wild grounds of an ancient mansion added to our received knowledge gleaned over years of self-learning and curiosity. We had enjoyed one of the best community engagement projects this side of the moon equalled by East London In Flux”. No no no! First of all the Older People’s Day was advertised as beginning at 0945 but we know things don’t go that way. Things of a large scale conference nature for oldies usually warm up by midday. Mind you, where was the event advertised? Up Your Street crew, always on the ball and a guaranteed presence at all things relevant to seniors’ interests said, “No. Let’s get there at the beginning. There will probably be croissants, fruit juice and grapefruit delights.” (Being healthy- living conscious of course. ) Oh woe were we. Biscuits. Biscuits? We were delighted to be in the City Hall, a building of light and spirals and then we were down in the cloakroom or certainly not the Assembly Room (double-booked). Mmm. Today was a chance to know the link between art and culture and what’s on offer in the form of dance, drama, singing, art and whatever to make us whole. Cinema was way down the list. I knew the agenda was not going to turn out as how it seemed. In fact Capital Age Festival in its gap year and Tate’s Soapbox had a platform to promote their affairs with a truly captive audience. The first item could have been called “Love Boris”. One speaker left to collect her son from boarding school. I took notes whilst listening to a panel of wise old women. It wasn’t a women’s event. And lo and behold there was not one geezer on the panel of speakers. In the basement space there were not up to a hundred older people either but we’re supposed to pretend the room was packed to the doors. Nope. One workshop was dismal. It’s irritating to be talked at as though we had not a university brain in the room. It’s devastating to hear seniors describe themselves as victims. The other afternoon workshop was a la Soapbox with an opportunity to debate issues specifically from the third or better “New” generation stance. * Our stimulus was a painting and a question such as “Are older people on the slag heap?” There in our workshop circle, we were able to see through massive windows the tops of Tower Bridge glinting gold in the Autumn sun. Down along the brown river KPMG Thames Clippers sailed their way and the Gherkin shone, shone, shone. Back in the room we were stuffed with nice sandwiches and proper tea in china mugs. The theme of the Day was “Art, Culture and Older People” with a generous spread of the standard mantra that Art enhances the quality of our (older peeps) lives by enriching and illuminating us into positive states. There’s a debate in there somewhere. 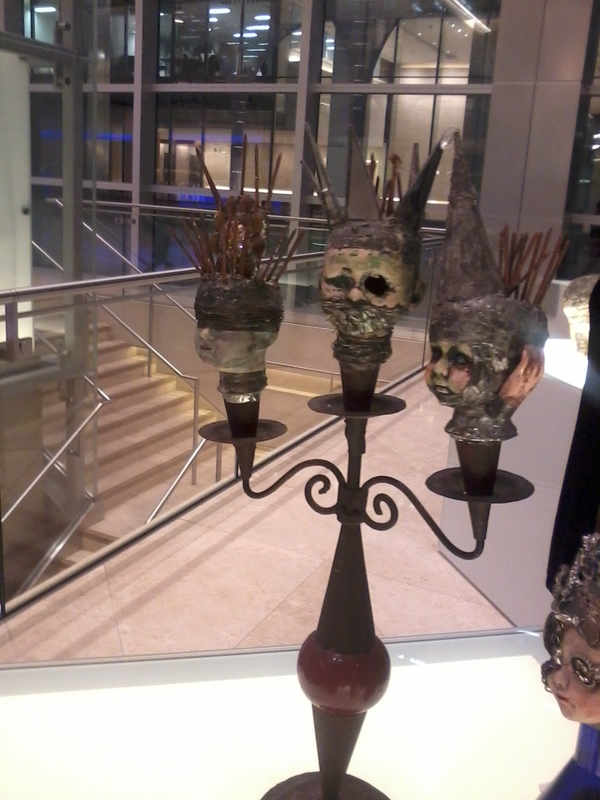 Note “art” not “arts” . The evaluation session was not that: The chair of LOPSG gave her summing -up using all her positive words and expressing gleefully her take on the day. She felt refreshed. I did not. She was inspired. Inspired by what? We talking together with moans and why can’t we’s? There was one exciting part where a couple of participants put forward from the floor their dissatisfaction at the way this LOPSG event stemming from City Hall was hardly advertised. I couldn’t believe my ears at such bravery. Up Your Street was mentioned by a speaker and by two participants. Age UK was mentioned but was it represented today? I was there. Age UK never has a dedicated ‘what’s on in art and culture’ page. Up Your Street concentrates on what’s on for seniors and that online service has been copied by many including London Boroughs with their paid community outreach staff. I get the feeling that older people (sic) were an afterthought in the big City Hall scheme of things. Neither refreshed nor worn -out, just an incy wincy bit disappointed. Facebook and Twitter, major-movers in the ‘what’s on’ world were never mentioned. Recently AgeUK and EE put on tea parties to get older people into the EE shops to handle tablets and thousands of seniors are on Facebook and Twitter. We were shown on the digi screen the welcome page for a new arts website specifically targeting seniors. Pretty white I’d say if we’re going for inclusion. 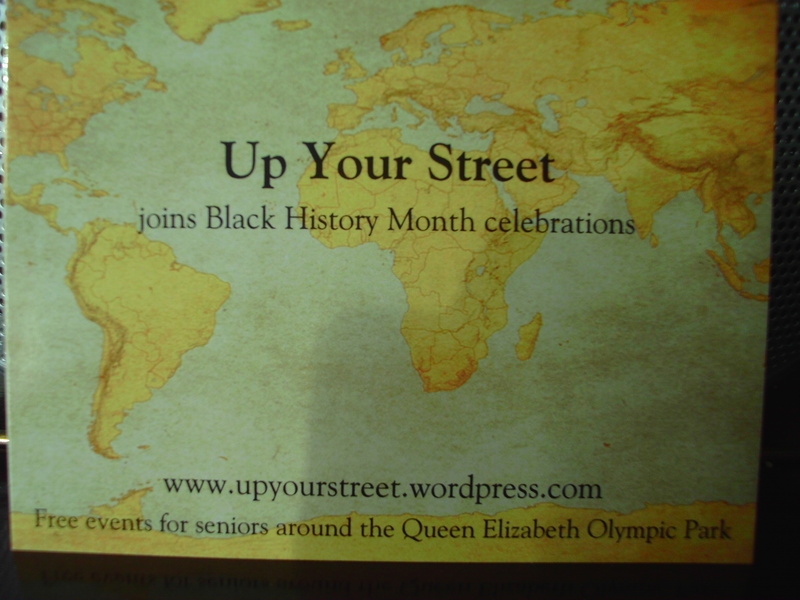 Up Your Street shares information about free events and activities for seniors around the Queen Elizabeth Olympic Park. Boris awarded Up Your Street an award for its services to London. There you go. Canary Wharf is an alien land to me but RAGWORKS “Girl With A Pearl Earring” was hung up in the KPMG foyer right by Canada Square and past the standing clocks. Thanks to Rosetta Arts we east end artists can keep art alive and popping up with exhibition opportunities. What a sight. Professionally curated, the paintings and prints form a lively background in a busy reception area. 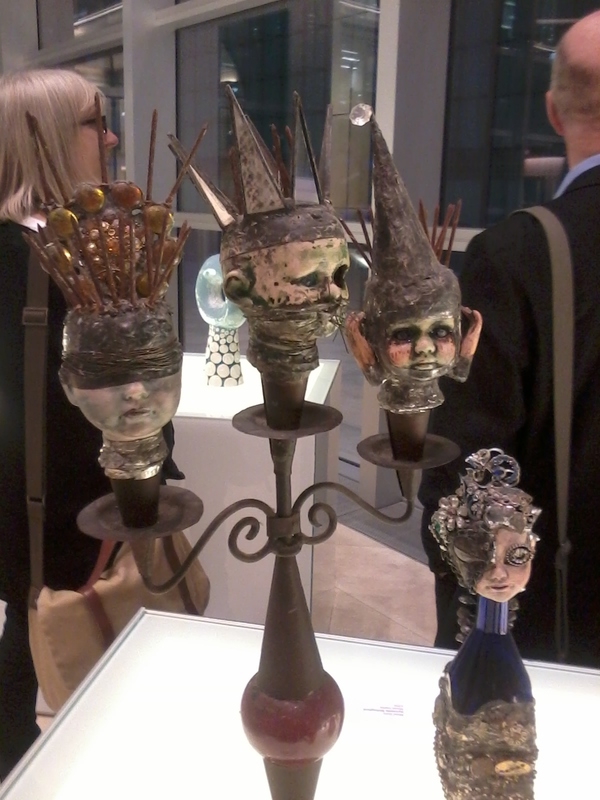 Some of the work was sold already so all success to those proud deserving artists. The lighting added a calm church-like ambience. The wine loosened our tongues and a relaxed evening was had by all. 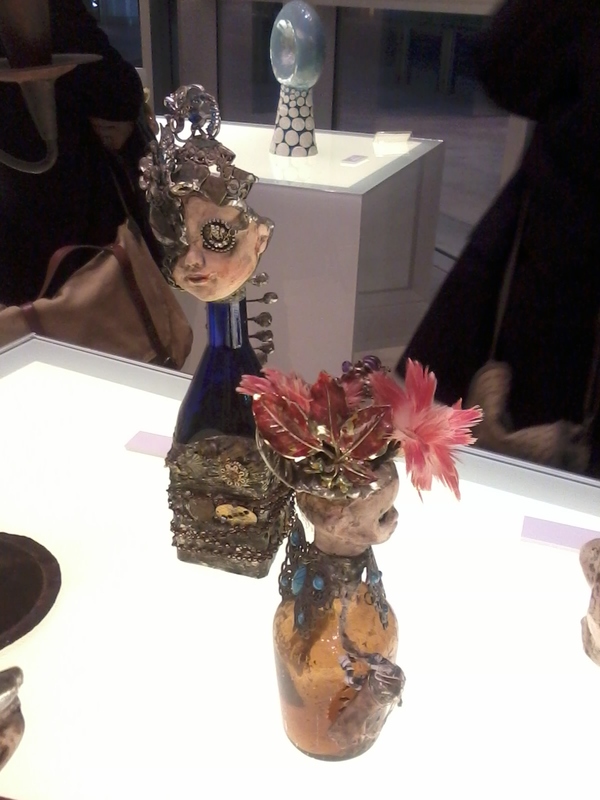 I really appreciated the work of Sylvestia Shillingford and Eva Price. Shillingford deals in the macabre . 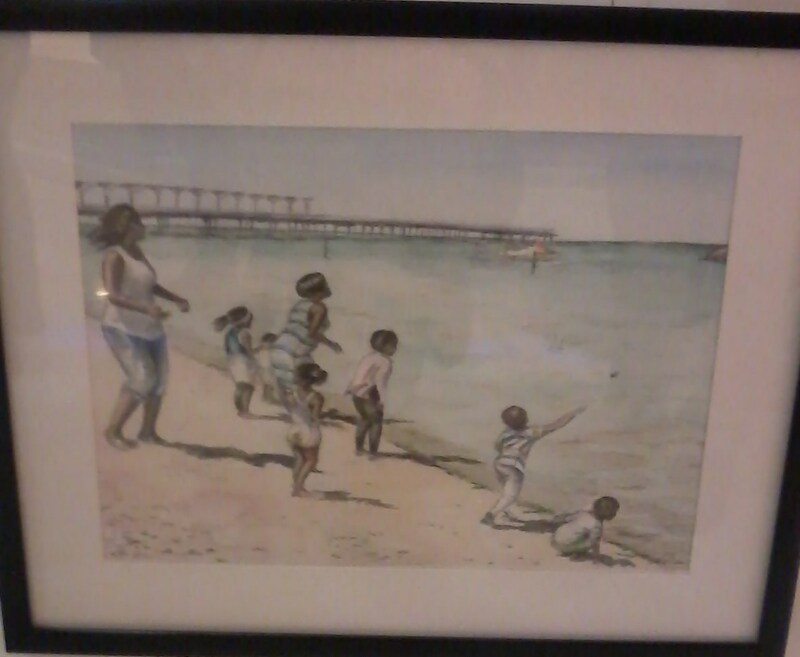 and Price is showing one of her lively fun pencil and watercolour works depicting children and mums enjoying the beach. You are invited to a party at the Garden this Sunday 28 September, 2 -10pm, to celebrate the restoration of the ‘Hackney Peace Carnival Mural’. The Mural, which is right outside the Garden’s front door, was designed by Ray Walker and painted by Anna Walker and Mick Jones almost 30 years ago. You can read more about its background on the London Mural Preservation Society’s website. Now Hackney Council have paid for the restoration of this cherished Dalston artwork, encouraged and supported by local campaign groups. Hirst Conservation and muralists Paul Butler and Linda James have been working all summer to bring the Mural back to its former glory. The People’s Kitchen will be cooking up a feast for all to share and children will be able to join Hackney artist Laura Halliwell in art sessions inspired by the Mural. Sunday’s event is an opportunity for Hackney residents (and of course others!) to get together to celebrate this iconic public artwork, its restoration and the spirit it portrays. We are asking visitors to share their memories of the Mural – the original ‘Peace Carnival’ event that took place over 30 years ago, the real people the painting depicts and what it means to today’s Hackney residents. Sunday is the start of our ongoing project to collect memories and stories about our much loved Dalston landmark. Hope to see you all on Sunday! Sun 28th Sept free 11.15-5pm with a break. Lloyd Park E17 gardening tips and workshops Understanding and Managing Soil. Waltham Forest residents only. free 11-4pm View Tube at Greenway. Vintage fair and sale. Stalls and food. (get to Pudding Mill Station). 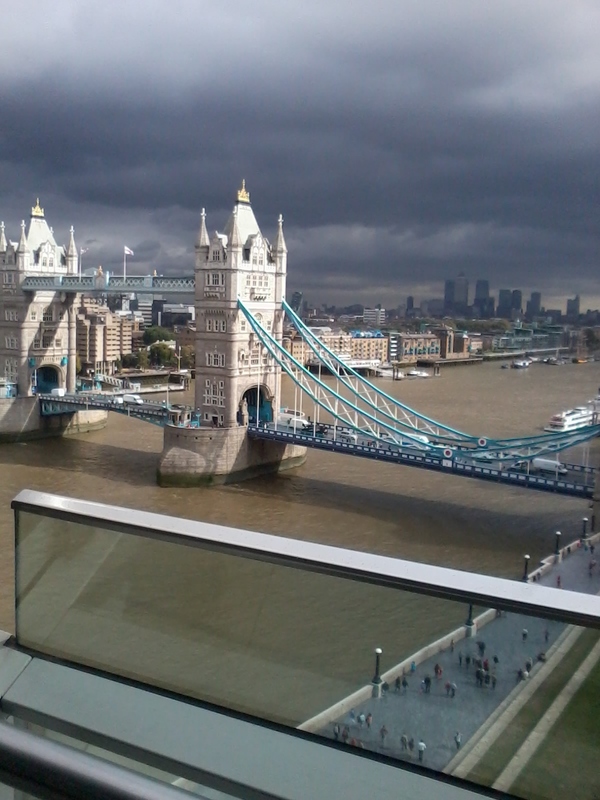 Tues 30th Sept free Hackney Empire Elders having a day out to the Tower of London. “On Wednesday afternoon, 1 October, Agewell Social Network will move from our computer centre to the Eastern Curve Garden, Dalston Lane. We are going to be part of the Hackney Circle garden party ‘food’ event. That means we will be talking about food, photographing food, perhaps cooking and eating it too.” No need to book. Come and join the Hackney Empire elders as they slip on their dancing shoes for an afternoon of quicksteps, foxtrots and plenty more. Whether you’re a certified waltzer or two-left-footed novice, we welcome you to come along and dance the day away! Wed 8th Oct free 11-1pm Soapbox at Tate Britain . Book at 02078838888 for a session discussing what you want in a lovely venue. Tea and biscuits too.